Tino gets a post all to himself. I met Tino while searching for tires in San Pedro. I'd been to every tire shop I could find multiple times and no-one could help or was trying beyond looking in the computer system for a tire I needed. I was just about to settle on an offroad tire that was too small when Tino poked his nose into my business. He spoke good english and started explaining what I needed to the guy behind the counter. When he saw I wasn't really happy with the offering he dropped what he was doing and told me to follow him. Within 5 minutes of meeting him I was in his truck and driving god knows where. The whole time this is happening we are chatting away about the trip and the bike and the whole time he is trolling me. In 5 minutes he could say enough things to upset everyone around him but the whole time he is joking, you hope. We eventually made it to a tire shop where they had a pirelli scorpion which I got for about 60 bucks. Super cheap and an excellent tire. I was ecstatic. I was really starting to think we'd have to wait for one from mexico and pay twice the price. 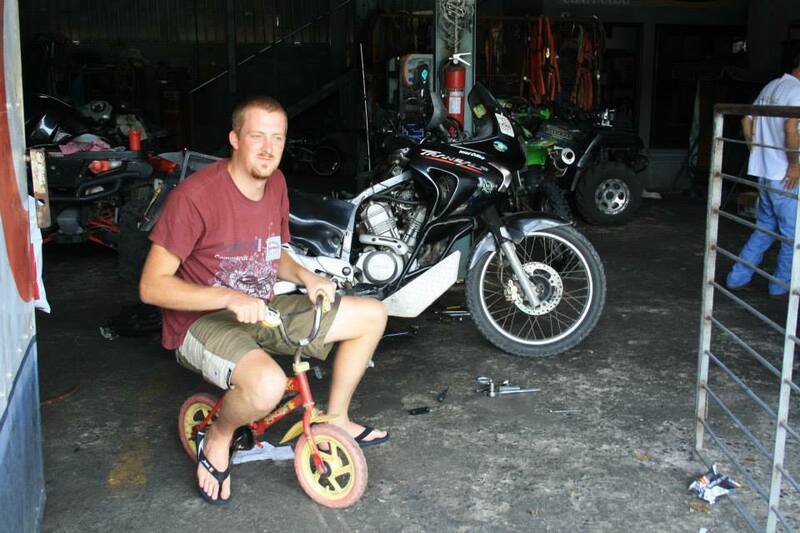 We went to visit his shop where he has a CBR600RR he's been rebuilding. I met some of his family who I am pretty sure were thinking that he'd managed to pick up a stray. We took the boat over from Utila to the mainland and Heather got her first real ride on the bike. We had taken some anti seasickness tablets before the crossing and Heather basically fell asleep on the back of the bike. Guess that means she trusts me. It was an uneventful ride, the bike struggled for power over 60mph and was drinking more fuel. Definite carb problem. We stayed a night halfway to San Pedro. Woke up to breakfast on the beach before carrying on, we got into SP the next day and went straight to visit Tino. Needless to say Tino continued to rib me when we got there. Joking about throwing the bike out and buying a new one. 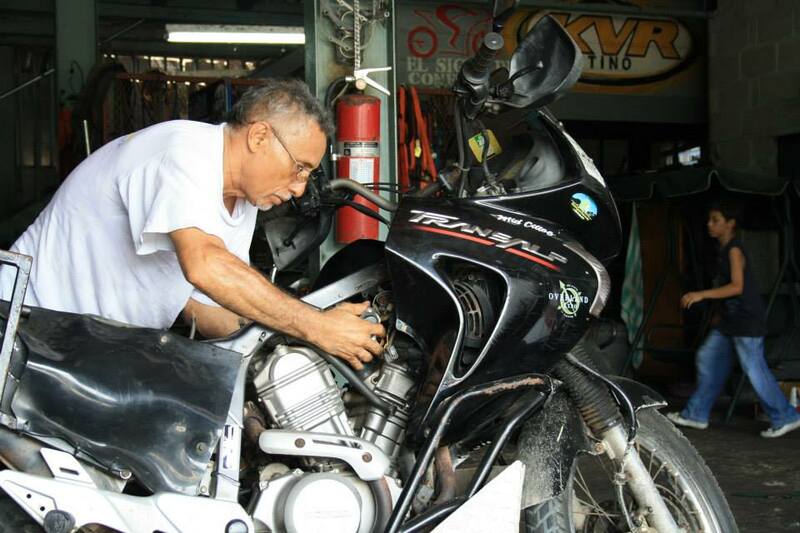 Tino and his son worked hard on the bike for two days. Concentrating on the carbs but also helping me with other bits n pieces that needed adjusting or replacing. After the first day he took us out to dinner in his favorite local Mexican restaurant. The next day Heather and me went back to the garage to see the progress. Things were going nicely but there were problems. The carbs were so dirty that the jets were completely blocked and nothing would shift the blockage. Spark plugs were ruined. It took a long time to get the bike running again. Tino trying to refit the carbs. Getting them in is a complete puzzle. Finally, with everything back together it was time to refill the tank and try and start her. No problem, started first time. Tinos son took the bike for a quick lap of the block to test everything was ok but as he was pulling in the bike died and wouldn't start again. After a good 15 minutes of panic and the alarm system refusing to allow the bike to start we found the Ignition Control Unit had managed to slip its mounting and the connection had got loose. Simple fix. Plug it back in and away we go. We went out with Tino again for a meal that night. We paid for the meal this time and Tino dropped us off back home. When I asked how much for the bike he shrugged it off. This was two days of hard work and he didn't ask for a penny. Can't thank you enough Tino. The next morning we set off for Lago De Yojoa in the mountains. The bike was running great, I had a big smile on my face and heather was probably looking forward to a part of the trip that doesn't center around motorbikes! So naive. Cheers len, what are you up to now? Oh you did very good job! 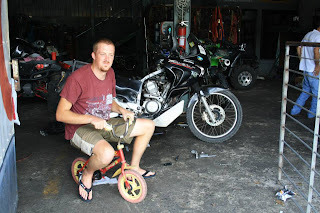 Great motorcycles I used in Thailand. When I was in city Chiang Mai, I accidentally found a team wich give for a rent nice scooters https://catmotors.net/health-and-life-insurance/ for very cheap price. So if you decide to visit this place, you know where you should look for a motorcycles.